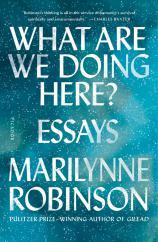 Was there ever a more loaded rhetorical question for our times than the title of Marilynne Robinson’s latest collection of essays? The 15 mind- and soul-expanding musings between the covers of WHAT ARE WE DOING HERE? once again proclaim the American Pulitzer Prize-winning author’s solid, unpretentious and compassionate grasp of the multiple realities facing humanity. It’s abundantly evident from this collection that whatever one might assume from their superficial media and baffling politics, Americans and some of their most influential institutions want to engage in substantial ideas beyond the narrow-casting of current events. WHAT ARE WE DOING HERE? brilliantly addresses the much more practical and complimentary question: Could you run that by us again? Nearly all of the essays here originated as live talks, given by invitation between 2015 and 2017. And those are but a fraction of Robinson’s actual activity, if her YouTube presence is any measure of the demand for her insightful observations in confusing times. So what is it about a semi-retired professor of English literature, and theologian by avocation, who is also a passionate exemplar of the bloom-where-you’re-planted philosophy (Iowa, to be exact)? How does Robinson catch and hold the attention of audiences whose backgrounds can extend far beyond her acknowledged areas of expertise? On stage she is no brash performer, choosing instead an understated, subtle, but focused and detailed delivery that reflects the meticulous care of her writing. Even her longest sentences ebb and flow with the thoughtful rhythm and expert cadence of the best musical composition. Her art, as the truism goes, hides art. And audiences just keep on filling the spaces where she speaks. "Robinson’s faith and solid (never naïve) optimism make WHAT ARE WE DOING HERE? a richly fulfilling read, one compelling enough to pull you from one essay to another and appreciate how meaningfully she sculpts her core themes to fit a fascinating variety of times and places." Long before her speeches and writing (fiction and nonfiction) captured the attention and admiration of great minds like former President Barak Obama, Robinson was tirelessly rekindling her nation’s social, cultural and even economic self-understanding. Weaving core themes of mindfulness and historic awareness throughout WHAT ARE WE DOING HERE?, she illustrates how selective, often strategically “forgotten,” segments of America’s past experience could be constructively embraced to better equip and inform present-day society. This has been no easy task, for her approach runs counter to decades of public and private education skewed to the perceived needs of capitalist economics, not to fulfilling the more sustainable benefits of deeper and broader forms of learning. In effect, Robinson is grasping the opposing forces of humanities and job-training education and attempting with her quiet ferocity to draw them closer together. Of the two, it’s no surprise to feel that economic interests still overwhelm the American psyche. But unlike so many contemporary intellectuals who have poured their literary and philosophical gifts into dark and directive explanations of why the world --- especially the so-called Western world --- is in the state it’s in (that is, generally bad and sliding downward by the moment), Robinson simultaneously plumbs the depths of society’s collective stupidity and depravity while reminding readers at unexpected moments just how amazing and full of potential we are as a species. For her, human potential and intelligence are inextricably bound up with faith, an issue she concedes is not the most popular attribute these days and badly damaged by the negative excesses of religion, both institutional and otherwise. But having explored the largely misunderstood theological roots of Puritanism in both England and New England, Robinson offers revealing and surprising insights about enlightened morality, governance and social cohesion forged by this tradition. Taken as a whole, WHAT ARE WE DOING HERE? ranges from an exhilarating sematic gallop to hard slogging work through the complexities of human endeavor, but the journey is never boring, intimidating or frustrating. Perhaps that’s why I simply cannot choose a “favorite” essay! Along with an intellectual diligence that translates into a sheer joy of learning, Robinson’s faith and solid (never naïve) optimism make WHAT ARE WE DOING HERE? a richly fulfilling read, one compelling enough to pull you from one essay to another and appreciate how meaningfully she sculpts her core themes to fit a fascinating variety of times and places. So does Robinson actually answer the title question? Yes and no. The reader steps back from the experience feeling, somehow, that it all matters. And that’s a good enough answer for me.